Close-up of Ryugu’s surface with arrows pointing to a rugged, layered boulder. Hayabusa2 is one of two missions currently visiting and attempting to collect samples from asteroids near the Earth. Its initial observations have already revealed a Ryugu that differed from expectations: rather than a wet mass of differently shaped rocks, it’s a spinning pile of uniform rubble with less water than expected. These new insights will help scientists write this object’s history, which now seems to include a period of rapid rotation and a potentially chaotic birth from a parent body. Hayabusa2 launched in December, 2014 and arrived at the 900-meter-wide (2,950-foot-wide) asteroid Ryugu last summer. It has since taken incredible images and just last month successfully (but quickly) touched down to collect a sample, firing a tantalum bullet into the asteroid and scooping up the resulting debris. Soon, it will drop an explosive onto Ryugu to collect samples beneath the asteroid’s surface. All the while, Hayabusa2 has been recording data as it whizzes around the rock, using a spectrometer which measures the different wavelengths of near-infrared radiation the asteroid reflects, a navigation camera, an infrared camera, a telescope, and a laser altitude measuring device. Scientists released results that present the most comprehensive story of Ryugu yet today at the 50th Lunar and Planetary Science Conference in Texas, and published them in three papers in Science. 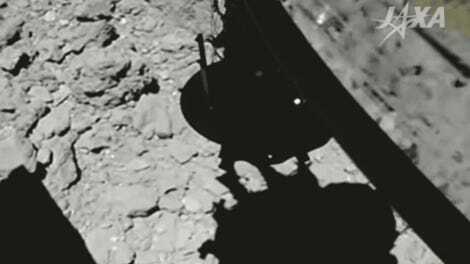 Most surprising was the fact that Ryugu shows signs of relatively little water across the whole asteroid compared to the asteroid Bennu, Kohei Kitazato, an associate professor at Japan’s University of Aizu working on Hayabusa2's near-infrared spectrometer, told Gizmodo. These results imply that Ryugu is blacker than coal, and looks a lot like the carbonaceous chondrites found here on Earth, relatively rare carbon-containing meteorites whose internal structure was altered by heat or shock. 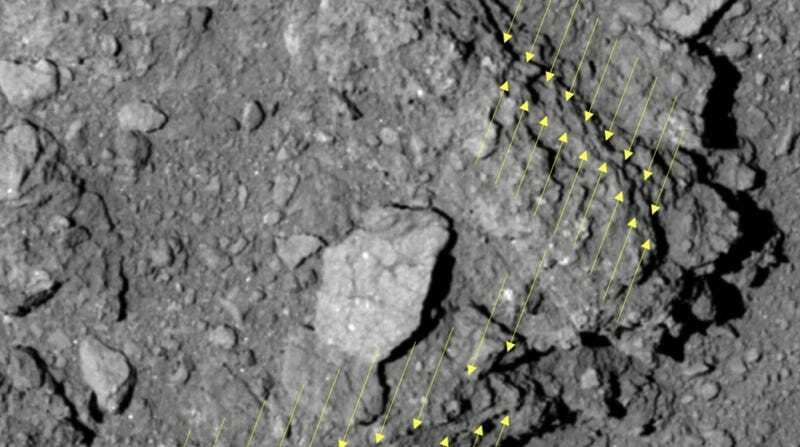 The results also suggest that Ryugu’s interior contains mostly the same-sized rocks, potentially fragments that fell off a larger body with relatively little water during an impact. Observations of the asteroid’s surface and shape reveal some of its more recent story. Its low density, just a little bit higher than that of water or around the same as that of coal, suggest that it is a porous rubble pile. Its top-like shape and the material that seems scattered around its surface suggest that it experienced a period of quick spinning in its past. Its surface is also strewn with lots of boulders of varying sizes up to 20 meters (65 feet) across or larger, of varying colors. The results imply that whatever body Ryugu broke off from experienced some sort of internal heating. Perhaps this heating will help scientists understand how close to the Solar System formed, or the nature of that larger body. The results so far will also help Hayabusa2's scientists pick a site for further sample collection along the asteroid’s equatorial ridge. These are initial results, which is why you’re seeing so many “suggests”-s, “perhaps”-s, and “maybe”-s. But they bring about exciting questions. Ryugu might tell scientists how minerals are delivered from the asteroid belt to Earth, Sei-ichiro Watanabe, lead author of another of the papers and professor at Nagoya University in Japan, told Gizmodo. It could tell us more about the history of the solar system. There’s just a lot we don’t know about asteroids right now. And if the mission is successful, it will bring back a piece of Ryugu for further study here on Earth—not the first time, but hopefully a greater quantity of sample than the first Hayabusa mission, which returned to earth with 1500 dust grains from the asteroid Itokawa after facing some troubles.